I’m not often surprised when a friend recommends a piece of cookware to me. I’ve been around kitchens for a couple decades now, including both professional kitchens and residential ones owned by my friends, and I’ve used pots and pans from dozens of labels. Ballarini was not one I was familiar with until a couple years ago. I was hesitant to investigate it at first. After all, shouldn’t an expert like myself have heard of any brand worth using? It turned out that I HAVE heard of Ballarini. While I might not recognize the name of this Italian cookware brand, I very much recognize the name of its parent company: Zwilling J.A. Henckels. I was surprised to learn that one of my favorite knife brands produced several fine lines of Italian-style cookware to compete with its own high-quality cookware offerings. Once I learned this, I had to try this cookware out for myself. Under its own label, Henckels produces some of the finest kitchen tools you can find. This includes both its trademark knives, its cookware, and a few other products that bear the Zwilling name. 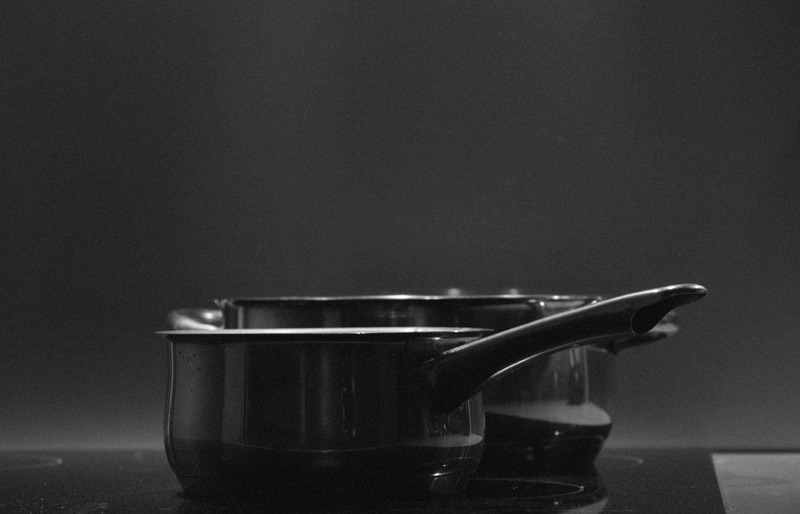 How would Ballarini’s cookware sets compare? If you decide that you’d prefer a non-stick cooking surface to reduce hassle, there’s no better material to use for the pan than aluminum. If you’re after a heavier, more durable non-stick set, the Como line is the better choice. Ballarini produces durable, professional-quality cookware that’s more than qualified to stand up to the rigors of your home kitchen. This carbon steel skillet gives you a unique way to cook. Unlike traditional tri-ply options, it’s designed with heat retention in mind. 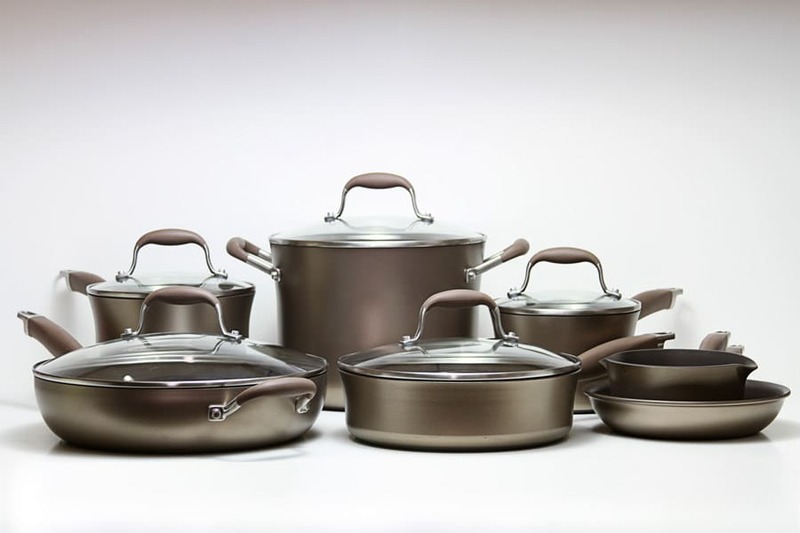 Ballarini primarily produces non-stick aluminum cookware. In my opinion, this is the best blend of performance and convenience for many home kitchens. If you decide that you’d prefer a non-stick cooking surface to reduce hassle, there’s no better material to use for the pan than aluminum. Why is this? The reason is pretty simple: aluminum conducts heat really well. This won’t come as a huge surprise to anyone who’s read my other cookware reviews, but it’s just as true in a Ballarini pan as it is in an All-Clad pan. Aluminum is light, inexpensive, and conducts heat more than five times as well as steel. There are two downsides to aluminum. One, it’s not a good cooking surface. With a non-stick pan, however, you dodge this issue by having a layer of non-stick in between the pan and your food. You’re not actually cooking food on aluminum. Instead, you’re cooking it on Grantium, which is a ceramic-reinforced PTFE that’s incredibly effective. Grantium is non-reactive and totally food safe, meaning that you can dodge any safety concerns you might have with aluminum while ensuring your acidic foods don’t react with your pan. Second, aluminum is a bit softer than steel, meaning it’ll get dinged up if it’s used as the outer layer of the pan. Just like the first issue, the use of non-stick also invalidates this concern, although for a totally different reason. 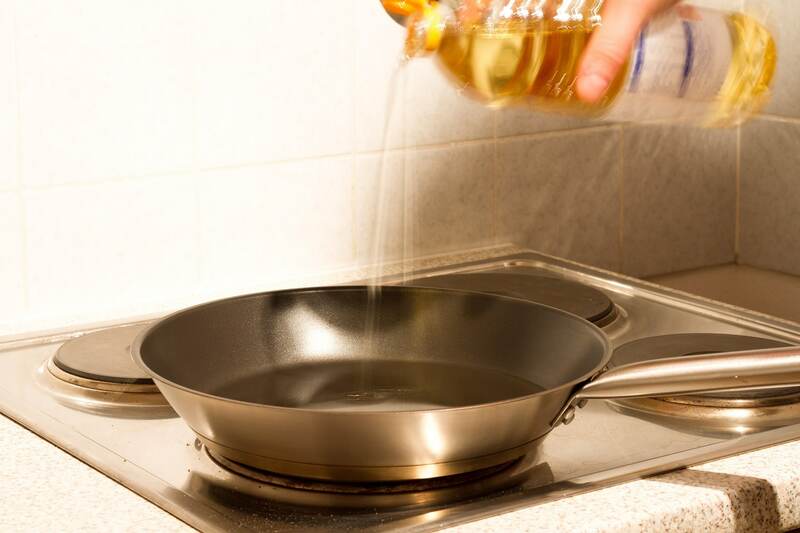 Non-stick coatings don’t last for more than a few years, meaning that you’ll be more-or-less forced to replace your pots and pans before the outsides get too dinged up. My normal estimate for the lifespan of a non-stick pan is 5 years at most. Grantium is a special kind of non-stick coating that seems to be a bit more durable than most. 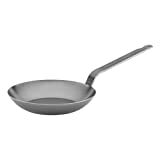 It shares properties with both ceramic non-stick and “traditional” Teflon coatings. I can’t speak to the science involved, but I can say that it seems both durable, effective, and fairly scratch resistant compared to the Teflon you might find in a cheap anodized pan. The pots and pans in this set come with glass lids that fit quite nicely. The handles on both the lids and the pots themselves are made out of a polymer that doesn’t get hot at all while the cookware is in use. Both the inside and the outside of the pans have a speckled gray finish that’s somewhat reminiscent of a Paula Deen cookware set. Overall, however, the Ballarini pieces seem like they’re much higher quality. One notable feature that this cookware set offers is the inclusion of “thermopoint” spots near the base of the handle. These dots change color as the temperature of your pan rises and falls, ostensibly giving you the power to tell when your pan is at the perfect frying temperature. I personally don’t think this is a very useful feature. 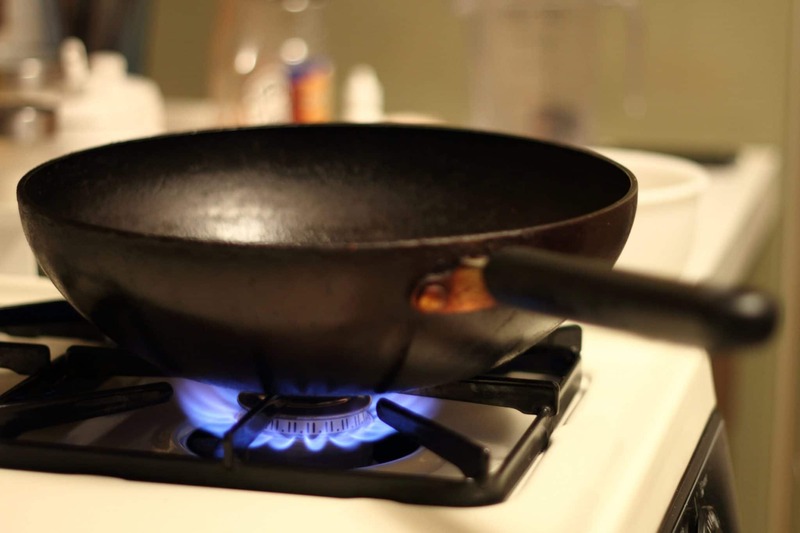 Cookware can be at more than two temperatures, and it’s important for a chef to be able to tell whether a pan is just barely warm enough to cook an egg or too hot to cook meat without burning one side. The thermopoint spots might help a novice cook, sure, but they’ll also distract that same cook from learning useful cooking skills that tell them more about the temperature of a pan. There’s nothing wrong with buying pans with this feature, of course. You can simply not use it. Regardless of my own personal views on the usefulness of this feature, it’s a neat inclusion that’s very much worth having in your pots and pans if it gets you to use them more. Overall, the Ballarini Parma set is a high-quality non-stick aluminum cookware line that gives you pretty much everything you want in a set of non-stick pans. 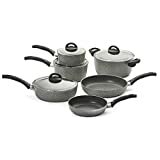 It’s got a unique non-stick coating that’s particularly durable and effective, aluminum bases that heat up quickly and distribute heat evenly, and a few features that make this set especially easy to use in the kitchen. Overall, it’s a solid choice for anyone looking for a slightly nicer non-stick cookware set. There are several differences between the Parma line above and this Como set. Both options are made by Ballaraini, sure, but they’re made for slightly different audiences. If you’re after a heavier, more durable non-stick set, the Como line is the better choice. For starters, this Como set is a bit thicker. While it’s made from the same cold-forged aluminum, Ballarini has made this set extra thick. This means that it’s slightly more resistant to being dinged up and has a little bit more heft in your hands. The non-stick coating is also slightly different. Ballarini still has elected to use a ceramic-reinforced PTFE, but this time there are three layers of the coating in order to ensure that your pots and pans will stand up to the rigors of time. As far as appearance goes, this cookware set boasts simple black interiors and exteriors. It’s not going to make a splash, sure, but it’ll also go with any other cookware or kitchen decor you might have. Performance-wise, this set is fairly comparable to the Parma line above. It’s got the same great heat distribution and quick heating. The extra material doesn’t seem to reduce boiling times by a noticeable amount. 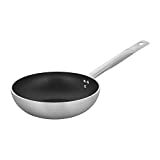 The non-stick seems equally effective when it comes to cooking eggs and other sticky foods with a minimum of cooking fat. There are two downsides to this set. First, it’s not the cheapest line in the world. While it’s a bit more durable than some other non-stick sets, it still won’t last as long as a stainless steel set of cookware. This means that you should only pick up this set if you don’t mind replacing it in three to five years. Second, Ballarini has chosen to stick with PTFE for its non-stick coatings. I want to be clear when I say this: there are no safety concerns with modern PTFE at normal cooking temperatures. Nevertheless, a number of people have been switching over to pure ceramic-based non-stick coatings for a number of reasons, including durability, unsubstantiated safety concerns, and cost. I’m not totally sold on ceramic — I think it has a number of flaws still — but I do think it holds a slight edge over PTFE-style non-sticks these days due to how it fails. While both non-sticks will stop being effective over time, ceramic coatings simply get stickier. By contrast, PTFE tends to flake off. Despite these concerns, the Como line by Ballarini is one of my top choices in higher-end non-stick cookware. It very much competes with cookware offered by luxury brands as well as celebrity endorsed cookware and store-brand cookware — even Kirkland. 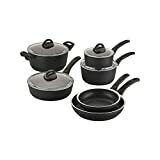 If you’d like to get one of the finest sets of non-stick cookware on the market, the Como set may be your best choice. With most cookware brands, I’d suggest picking up a cheap frying pan to use with eggs for a year or two. Getting a cheap egg pan means you won’t have to worry about replacing it should you accidentally scratch it or should the non-stick wear out a bit earlier than you expected. With Ballarini, however, I’m going to recommend this slightly more expensive frying pan for the same purpose. Why? The answer is simple: quality. Ballarini produces durable, professional-quality cookware that’s more than qualified to stand up to the rigors of your home kitchen. This aluminum frying pan offers more than just a non-stick surface with good heat distribution. It also offers careful, solid construction that will last for longer than a cheap department store pan. This means you get a flat, even base, a solid, riveted handle that’s designed to resist getting hot, and an extra durable non-stick. Ballarini’s Kerastone coating has been tested in professional kitchens around the world and is scratch resistant enough to survive the occasional use of a metal utensil. For me, these features make this pan an attractive option. If you’re in need of a slightly more durable egg pan, this Ballarini Professionale pan is a great way to go. Be sure to check out the other sizes it’s available in to make sure you get the right fit for your kitchen. Ballarini does make a line of metal cookware. This carbon steel skillet gives you a unique way to cook. Unlike traditional tri-ply options, it’s designed with heat retention in mind. This means that it’s excellent for slow cooking and recipes that require a very hot pan. 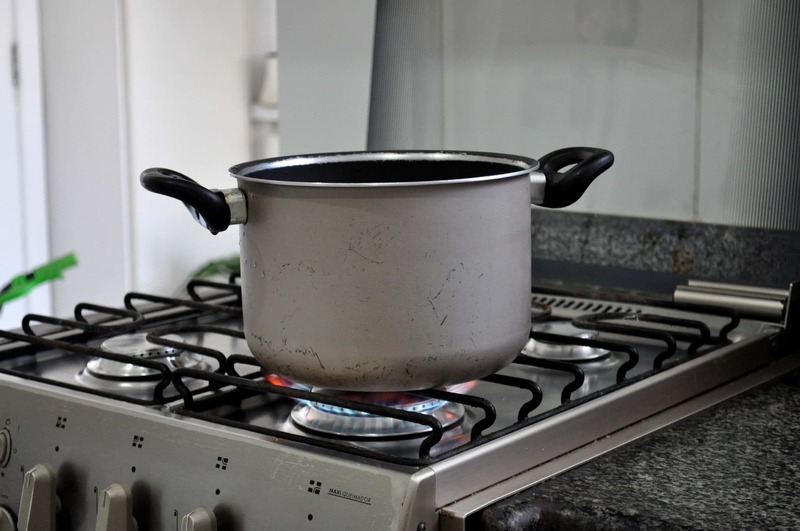 Normally, you want your cookware to heat up quickly and cool down quickly. 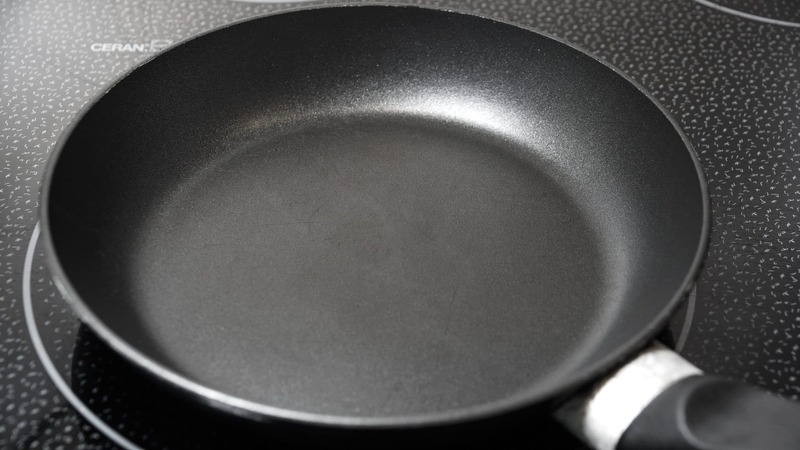 This skillet does neither. Instead, the carbon steel used in its construction takes its time to heat up. Once it’s hot, however, the pan itself retains quite a lot of heat. If you’re familiar with cast iron, this pan works the same way. It’s just as durable, too. The big advantage that this pan has over a cast iron skillet is the weight. Cast iron is crazy heavy, meaning that it’s awkward to use in many situations. By contrast, this carbon steel frying pan is quite lightweight. There’s still more than enough metal to retain the heat you need for your cooking. Without a non-stick surface, this pan is slightly more complicated to cook on than the above options. You can season it just like cast iron, however, meaning that you’ll be able to cook fairly sticky foods with no problems. All you need is a little bit of cooking fat as long as you maintain your seasoning. One extra benefit of this pan: it can get really, really hot. Even the best modern non-stick coating struggles to deal with high temperatures, meaning you can’t sear a steak properly in a non-stick pan. This carbon steel pan can gracefully handle temperatures of up to 600 F.
If you’re after a cast iron alternative that’s a bit lighter or you need a pan for searing meats at high temperatures, this Ballarini frying pan is the way to go. It’s a unique choice that isn’t suited for every single task in the kitchen. The upside, however, is that it excels at the specialty cooking tasks that it’s designed for. Ballarini: A Hidden Italian Gem? Ballarini might not have been on my radar five years ago, but it’s very much one of the better cookware brands on the market today. This Italian cookware manufacturer has won me over with its dedication to quality and fairly affordable prices. Whether you want a non-stick cookware set, an individual non-stick skillet, or a carbon steel alternative to a cast iron pan, Ballarini is a solid option that won’t let you down.